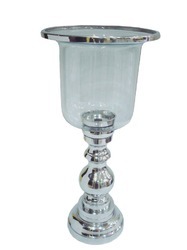 Prominent & Leading Manufacturer from Moradabad, we offer metal candle hurricane, tall candle hurricane and candle hurricane with glass. 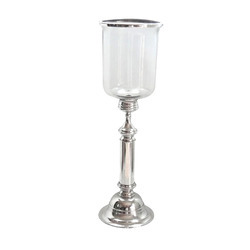 We are one of the prominent manufacturers and exporters of Metal Candle Hurricane. Made as per the industry set standards, this candle hurricane is commonly used for decorating application in hotels, homes, and restaurants. The offered candle hurricane is highly demanded in the market for its elegant design, light weight, and attractive appearance. Furthermore, our esteemed customer can avail this candle hurricane in bulk at cost effective market price. Our company specializes in offering optimum quality Tall Candle Hurricane to our esteemed customers. Precisely designed in compliance with international quality standards, the offered candle hurricane is widely used for decorative purposes. Driven by an intense desire to attain maximum customer’s satisfaction, our logistic professionals assure the safe and timely delivery of this hurricane. As per the requirements of our customers, these products are available in different shapes and sizes. 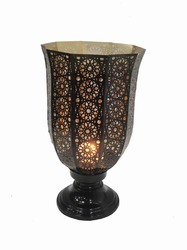 We hold expertise in offering Candle Hurricane with Glass to our prestigious customers. The offered hurricane is manufactured from finest quality metal and glass, which is obtained from well known vendor. Designed as per industry set standards, the offered product finds application in decorating interior of different hotels and restaurants. Keeping in mind the convenience of our valuable customers, we offer them easy payment options.